For the fun loving folks on your list, why not create a Fundex games gift basket? The company manufactures a variety of games that you could choose from including Professional Double Nine Dominoes and When Pigs Fly. Once you select the games, be sure to add some edible goodies to the gift basket too. That way, your friends will have something to snack on while they play the games. If your friends aren't into fun and games, a Picnic Time basket may prove to be more apropos. Picnic Time’s collection of baskets runs the gamut. So you should be able to find one that suits your friends’ style. 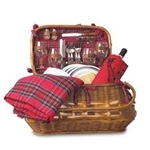 One that may do the trick is the Highlander Picnic Basket for four. It contains everything needed to enjoy a leisurely repast. Do you have die-hard grilling enthusiasts on your list too? Well why not create a thrill of the grill gift basket? Great items to place in the basket are stainless steel BBQ tool sets, BBQ serving platters, bratwurst-hot dog roasters and kebab skewers. You may even want to throw in a bottle of barbecue sauce too. Are some of your friends pet lovers as well? If so, a dog gone it gift basket should make them smile. Fill the basket with items like Valterra Spill Proof Pet Water Dish, Bling Blinkers, Travel Pet Dishes, dog treats and Clean Machine’s Magic Pet Hair Remover. They’ll undoubtedly appreciate them all. 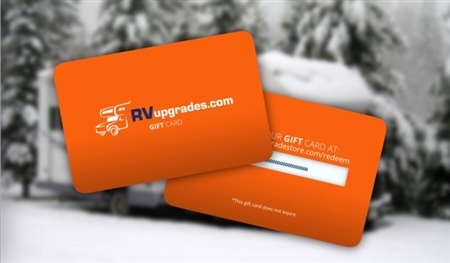 Finally, you could always opt to surprise them with a gift card or gift certificate to our RVupgrades store. If you do decide to purchase the certificates, consider attaching them to a RV die cast collectible. It would make a great impact and give the recipient something to add to their collection. For a closer look at these RV accessories and other gift ideas, please contact us.